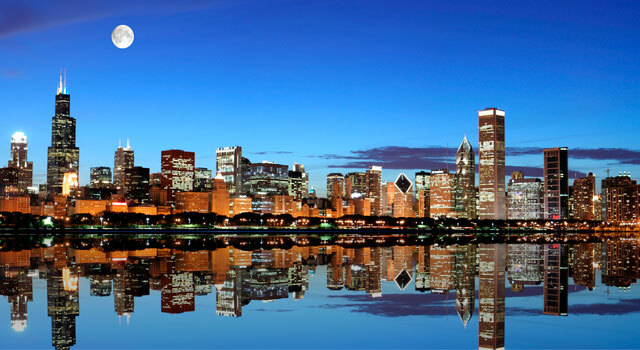 Use the information provided in this website to plan your travel to Chicago O'Hare Airport. 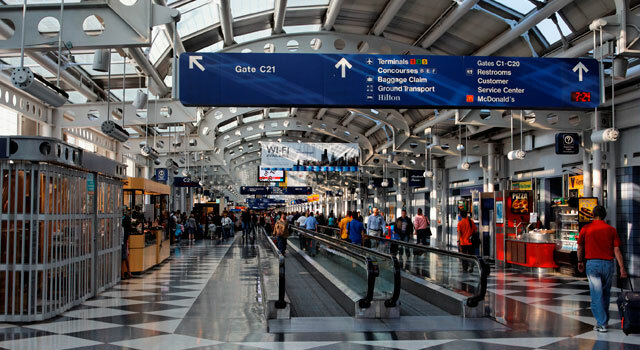 Find all the information regarding O'Hare Airport: Flights (Departures, Arrivals and Delays), Parking, Hotels and Accommodation, Rental car information, Transport and other important information. Check Chicago Travel Guide at Bautrip for more information about Chicago. O'Hare Airport (IATA: ORD, ICAO: KORD, FAA LID: ORD), simply known as Chicago Airport, is an airport located in Chicago, Illinois, 17 miles (27 km) northwest of the Chicago Loop. The Chicago Loop is the central business district of Chicago, Illinois. Chicago O'hare Airport has four operating Terminals. It serves the Chicago metropolitan area along with Midway Int. Airport, which is located at just 10 miles (16 km) of the Loop. The transit time from Central Loop to O'Hare International airport is approximatemily 40 minutes. The airport is involved in a modernization plan that should increase the maximum number of operations from 2,700 to 3,800 and also the passenger traffic. 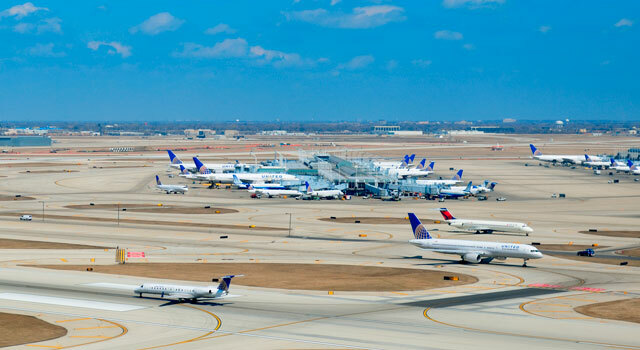 Chicago O'Hare Airport, as a megahub, is the fourth busiest airport in the world. In 2017, ORD airport handled 79,8 million passengers. O’Hare International Airport was voted the "Best Airport in North America" for 10 years, by readers of the U.S. Edition of Business Traveler Magazine (1998 - 2003) and Global Traveler Magazine (2004 - 2007). - ATS: By the Airport Transit System, transfer from one terminal to each other. Check in detail at transportation page. 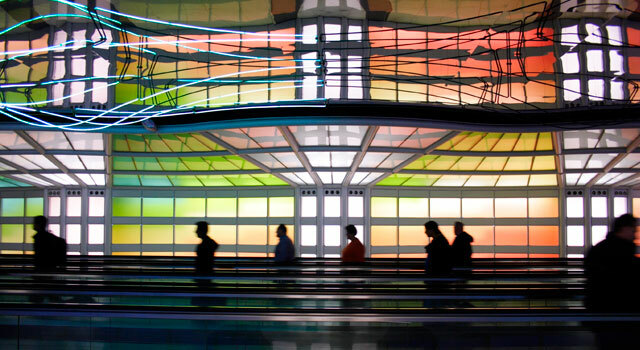 - O'Hare Airport serves an approximate average of 2,400 aircraft operations per day. - The airport is connected with more than 60 foreign destinations. 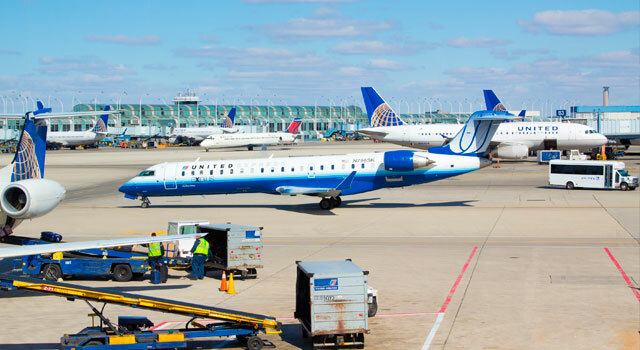 Chicago Airport is the largest hub of United Airlines and American Airlines as well as a hub for regional carrier Air Choice One and a focus city for Frontier Airlines. It is the second-largest hub in terms of passengers of United. - On the airplane, gates or counters, please, contact with your airline. - In the public areas, please, contact with the Chicago Police Department calling: (773) 686 2385. - At the security screening locations, please, contact with TSA at: (773) 377 1210.